Durga lay down her trident and sheathed her sword. She brushed her dark hair from her eyes. Her hair was sticky with blood. She surveyed the battlefield. The demons Canda and Munda gleefully danced around the carcasses of dead humans and animals alike, prematurely claiming victory for themselves. The Goddess’ eyes narrowed into slits. Her brow furrowed. There was a sharp pain at her forehead. Durga covered her eyes with both hands as the world grew darker. The pain at her forehead felt like the intensity of labor. The contractions grew stronger and stronger until a dark figure burst forth from her brow. As suddenly as it had come, the pain was gone. Durga smiled at the Devi who bowed before her. Kali had emerged to rule the day. Kali sprang into action. She slayed every demon who came at her. There was no mercy in her eyes. Finally, she decapitated Canda and Munda themselves and brought their heads to the great Durga. Durga was well pleased by this and was about to thank Kali for her service, when Kali returned to the battlefield, attacking the Devas as well! Lost in her lust for blood, Kali was out of control. In desperation, Durga summoned Shiva for help. Shiva knew just what to do. He transformed himself into an infant and began to wail. Kali, about to thrust her spear into the eye of a soldier, immediately stopped and turned toward the sound. She rushed to infant Shiva and cuddled him close to her chest. She rocked the baby back and forth. Shiva knew that if love and compassion were awakened in the dark Goddess, it would be every bit as fierce as her destructive force. And indeed, it is so! Inviting Kali into our lives. 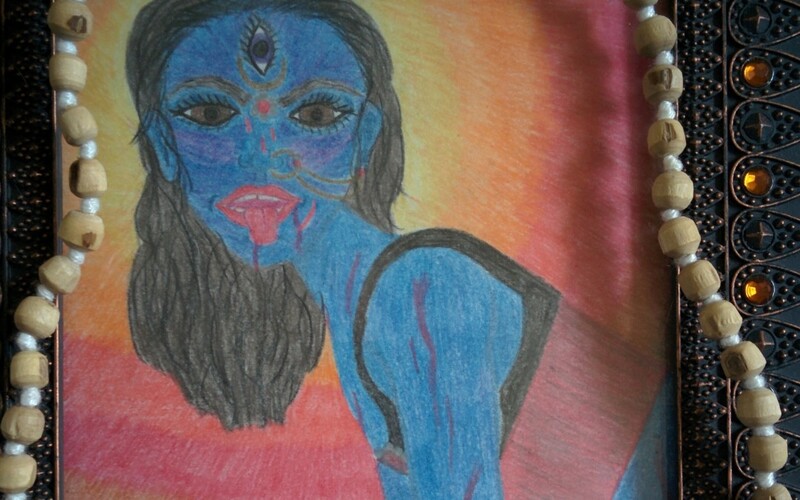 I first encountered the goddess Kali as I was reading the book Awakening Shakti by Sally Kempton. As there were ten or so other yoga goddesses I could read about in that book, I happily skipped the chapter about the frightening Dark Mother in favor of the studious Saraswati and the luck-bringing Lakshimi. For me, Kali became like a critical and overly-opinionated relative one only encounters around the holidays. It was fine to visit with her every once in a while, especially to avoid arousing her anger, but she was certainly not someone I wanted to invite into my life every day. If we’re honest with ourselves, most of us have that sort of relationship with Kali. Given the symbols that surround her- a garland of skulls, skirt of severed human arms, outstretched tongue dripping with blood- who could really blame us? However, when we finally tire of the pain and drama we create in our own lives and are ready to change, it is not the beautiful Parvati or even the courageous Durga we call upon. We cry out to Kali, who severs the head of our ego and scoops us to her breast just as she did baby Shiva. Being loved by the Dark Mother. What we see in our personal lives is reflected in the world around us as well. There is much talk of the rise of the Divine Feminine these days, and with the much-needed rise of female leadership and movements such as #metoo, we see this is so. However, it is not as if the Divine Feminine hasn’t always been there. She has, but under the guise of gentler faces. Yet, as humans continue to destroy the environment and each other, its time for Big Momma to put on her angry eyebrows and go to work. Like any good mother, Kali does not enter the arena with anger and the intent to punish her children. Rather, in our agony, she looks us in the eyes and asks, “Now are you ready to try this another way?” As we nod our heads and surrender, knowing our best thinking got us here, She steps in to do the that which, on our own, we cannot. Life: a devotional practice to Kali. To be a devotee of Kali does not require grand gestures. We can keep our candles and incense to ourselves. They don’t impress her much. Honoring Kali requires two things: our honesty and our willingness. We must take a good, long look at our lives, individually and collectively, and ask, “Yes, and how is doing things your way working out?” If we’re honest with ourselves, we could be doing better. If we are willing, Kali will show us how. Kali will present us with endless opportunities to get it right. Where we were weak before, we can choose to be strong. Where we have been childish and immature, we can choose to be mature adults. When we’ve missed the mark time and time again, Kali coaxes her children, “Let’s try that one more time.” Through the discipline of our yoga practice and the unconditional love of the Universe expressed as Kali, more and more we show up as our true selves and become the people we are capable of being. What has Kali to do with me? Are the end of every pilgrimage. I float like a lily on an ocean of bliss. Is the root of all happiness. Goddess, and all becomes clear. Kempton, Sally. 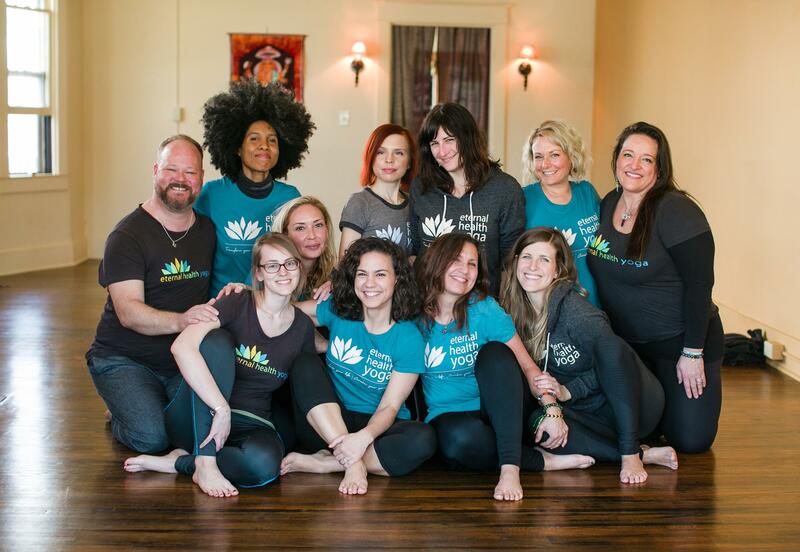 Awakening Shakti: The Transformative Power of the Goddesses of Yoga. SoundsTrue. 2013. Monaghan, Patricia. The Goddess Companion: Daily Meditations on the Feminine Spirit. Llewellyn, 2000.